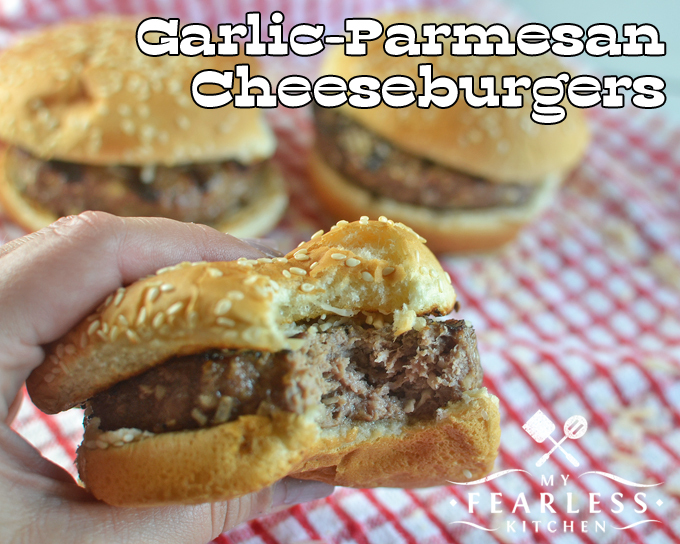 If you love garlic, parmesan, and cheeseburgers, these Garlic-Parmesan Cheeseburgers will be your new favorite burger! They are a quick fix on your grill. These burgers are to die for! 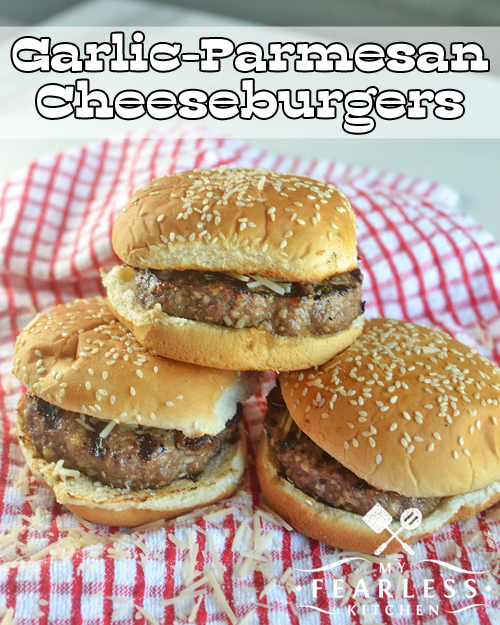 If you like garlic and Parmesan cheese, you will absolutely love these burgers! 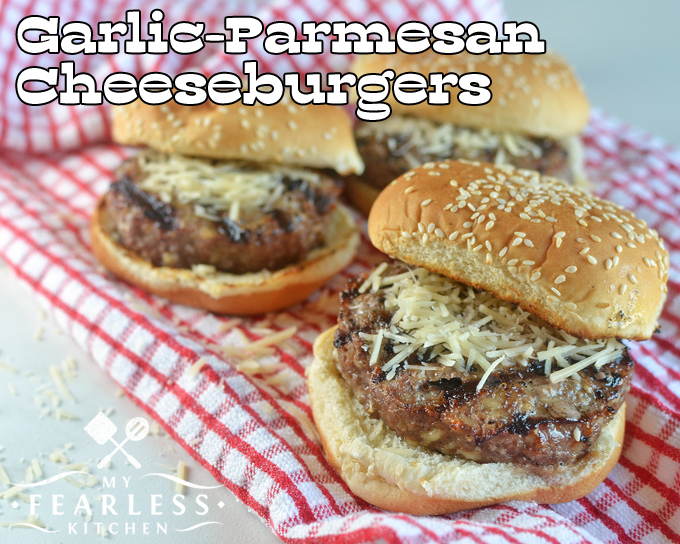 These Garlic-Parmesan Cheeseburgers are loaded with Parmesan cheese. The trick is to mix the cheese into the burger patties, and to top the burgers with extra Parmesan! I’m usually a big fan of the grated Parmesan cheese. But for this recipe, you will want to use shredded Parmesan. You can find shredded Parmesan cheese in the section with the other shredded cheeses in your grocery store. And garlic. Fresh garlic. Use a garlic press to mince 3 or 4 cloves or garlic quickly, and with not a lot of mess. When I’m mixing everything together to make the cheeseburgers, I use my hands. You could use a spoon or spatula, but I think it’s much easier to get all the ingredients evenly mixed when I do it by hand. Just make sure to wash your hands well after handling the raw meat! Divide the burger mixture into four roughly equal portions. Then place each portion into a burger press to make the patties. I use this burger press all the time. You can also form the patties with your hands, but the burger press makes your patties more even. Then grill them up over high heat! The burgers should only take 3-4 minutes per side. Try to only flip them once, when the burgers easily release from the grill. They are done when the internal temperature is 160 degrees F. (Measure the temperature with a meat thermometer like this one.) Toast the hamburger buns if you like, and top the burgers with extra Parmesan! What’s the Difference Between Barbecuing & Grilling? In a medium bowl, combine beef, garlic, Parmesan cheese, minced onion, and Worcestershire sauce. Using your hands, mix until all ingredients are well-mixed. Separate the beef mixture into 4 approximately equal portions. Grill burgers for 3-4 minutes per side, flipping once, until the internal temperature measures 160 degrees F with a meat thermometer. If desired, lightly toast buns on the grill during last few minutes of cooking. Top burgers with extra Parmesan cheese. Serve immediately. ooooooooh these sound amazing! Thanks for sharing on Homestead Blog Hop!